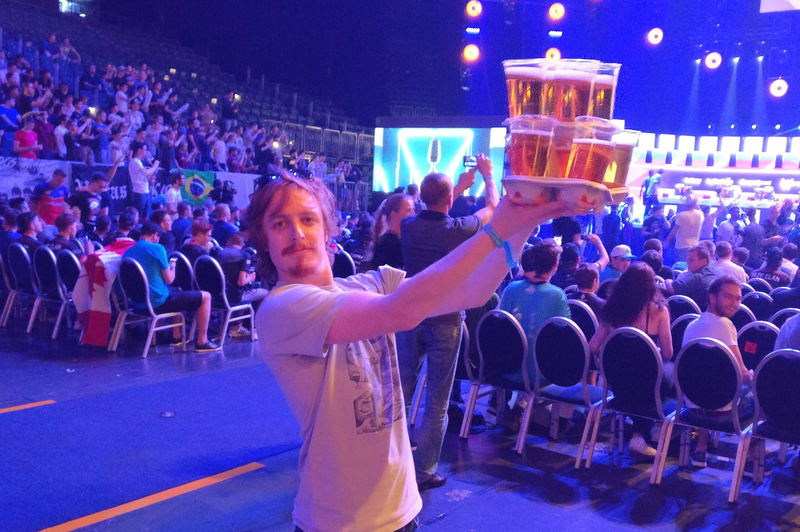 There have been a number of great matches at the event, and Cloud9's push to the grand finals has fans hyped, but nothing will top this guy’s bold decision to carry a shitload of beers back to his seat all at once. Taking place in Germany, the ESL One Cologne Counter-Strike tournament has a ton of beer. But even the thirstiest spectator would think twice before trying to carry what appears to be 8+ beers in a double-stack formation. “I’ve already carried 12 beer yesterday so I can carry 16 beer too,” is allegedly what the man said to the bartender when ordering his drinks, at least according to one Reddit user who claimed to be standing next to him at the time. I was at a Phillies game a few weeks back and tried carrying two lagers and a cheese steak at the same time. I couldn’t even manage that. Hailing from the VIP section of the crowd, the beer was most likely free as well. Attendees who purchased premium tickets for the tournament got access to an open bar and nine meal voucher tickets which were good for everything from pizza to potatoes. Because what goes better with a stack of hefeweizens than a baked spud? And what do you do with a bunch of free beer? Play beer pong of course. Also stack all of the empties. And as you would expect with the booze flowing freely, plenty of it ended up on the ground.